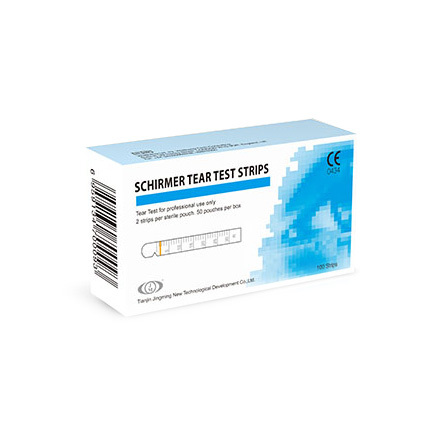 Schirmer Tear Test Strips are used for diagnosing reduction of the tear secretion caused by any related ophthalmic diseases. 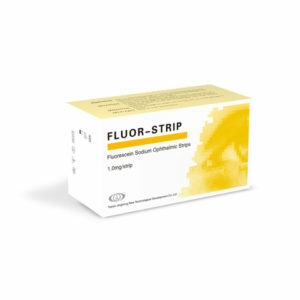 Made of filter paper, the product has a calibrated scale printed on the strip, on which a color line made of fluorescent dye will co-migrated with the tear flow. An easier and more precise reading will be provided. Strips can be kept for result comparison before- and after- treatment. 2 strips (L/R) per pouch, 100 pouches per box. Take one strip out of the pouch by forceps and make a crease at the tip of the strip. Put the creased end inside of patient’s lower lid with the other end out of the lid. Patient has to keep his or her eyes closed gently for 5 minutes, which give a proper time for the strip moistened by the tear flows. Then the strip can be taken off, but another 2 minutes waiting time is required before the length of the moistened area can be read. Patient should close eyes gently. Avoid touching cornea.